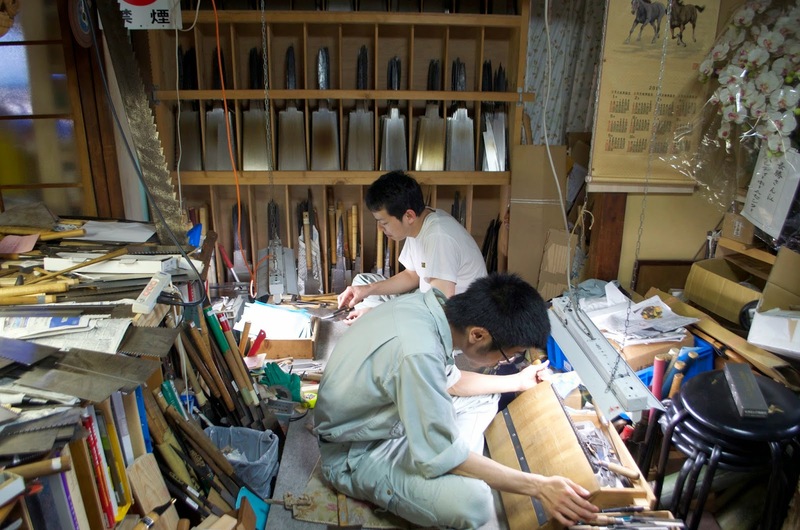 At an antique store I inquired about tool shops, and the staff mentioned one, saying it was a nokoyasan, or saw shop. They marked my map and I decided to spend my afternoon finding the place. It wasn't easy. 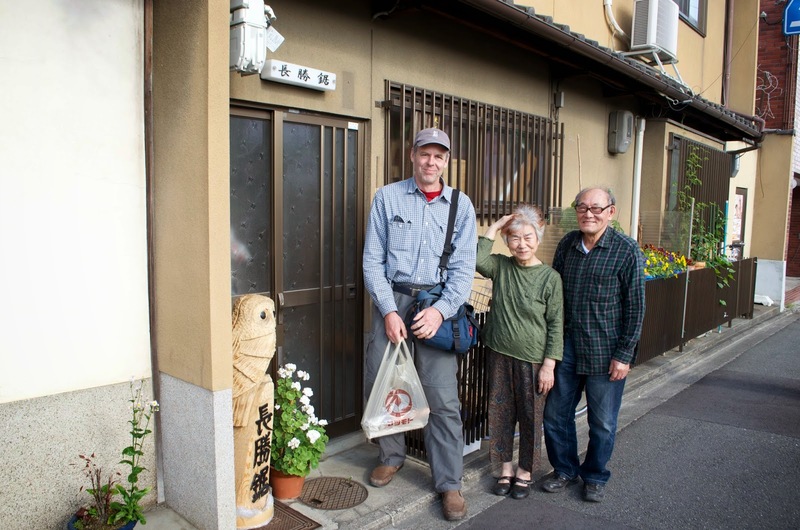 The map address was wrong, but I persevered and a sake shop owner got a more precise address. I still couldn't find the place so I asked a baker. He sent me down the street but warned me that the shop had no sign. Sure enough I overshot the place, but the friendly older woman at an amazing little bamboo ware store (I regret not photographing it) walked with me back up the street and rang the bell. Inside I found the saw sharpener in a cramped space overseeing the work of his two apprentices, who were both bent over large saws sharpening them. 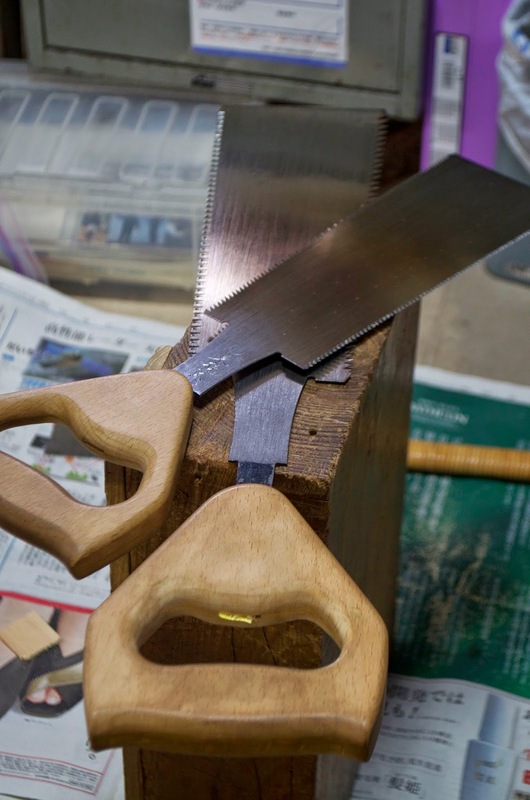 Note how the saws are held in wooden vices for sharpening. A selection of new saws on the rack. 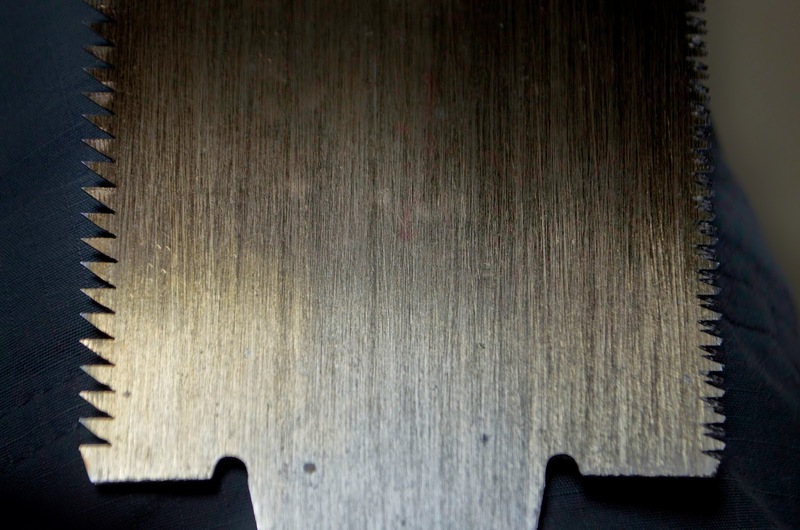 Close-up view of the saw vise. 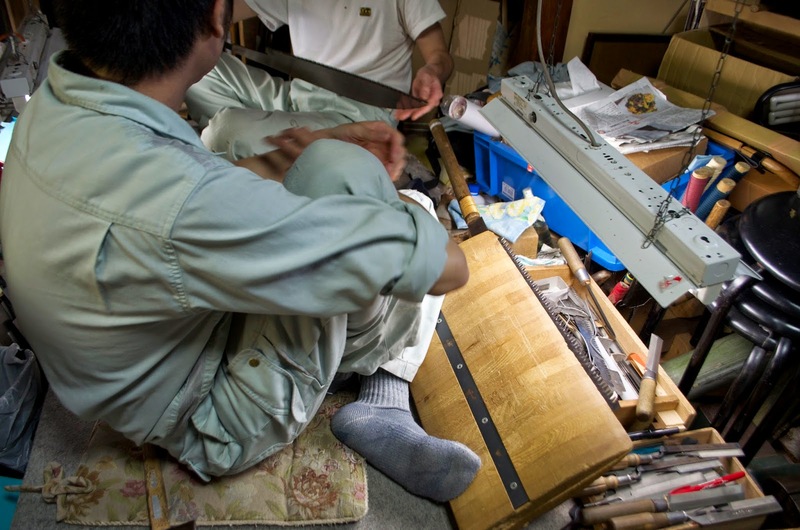 The saw maker said he had heard of me, and indeed he knew that I had built boats in Uryasu and Aomori. He went into the back and came out with two boatbuilders saws. I asked him how much they were and with a straight face he said "Hyaku man en." The Japanese count large numbers in tens of thousands so I always get a bit confused, and I thought he meant about $1,000. 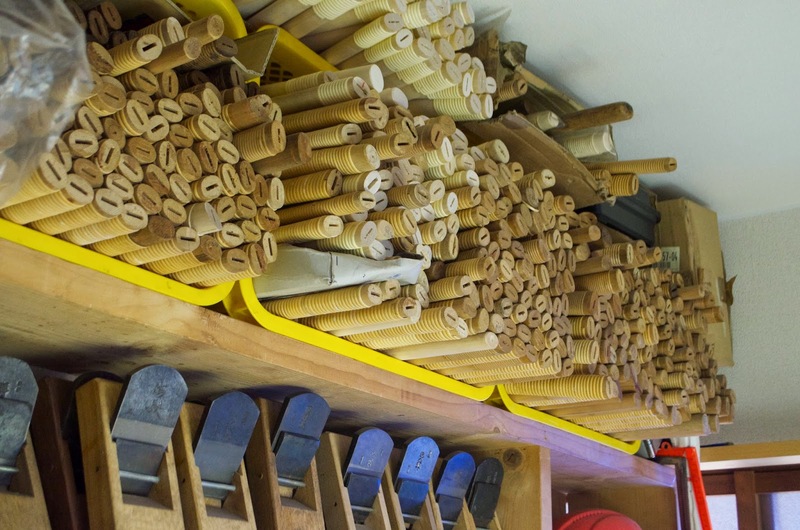 I could actually believe this price for a handmade specialty saw, but in fact he has said $10,000! He must have wondered why I was pondering this seriously when he burst into laughter, slapping me on the shoulder, and said, "It's a joke!" 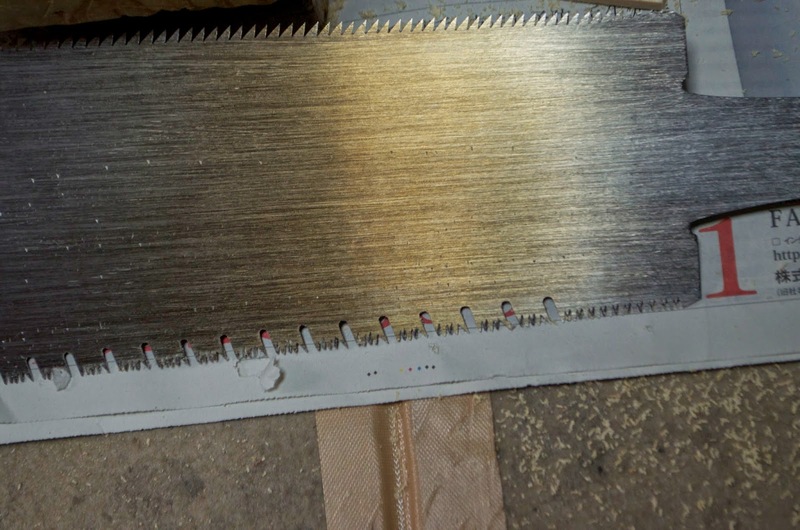 The price was actually $100 and I bought one of the saws on the spot. 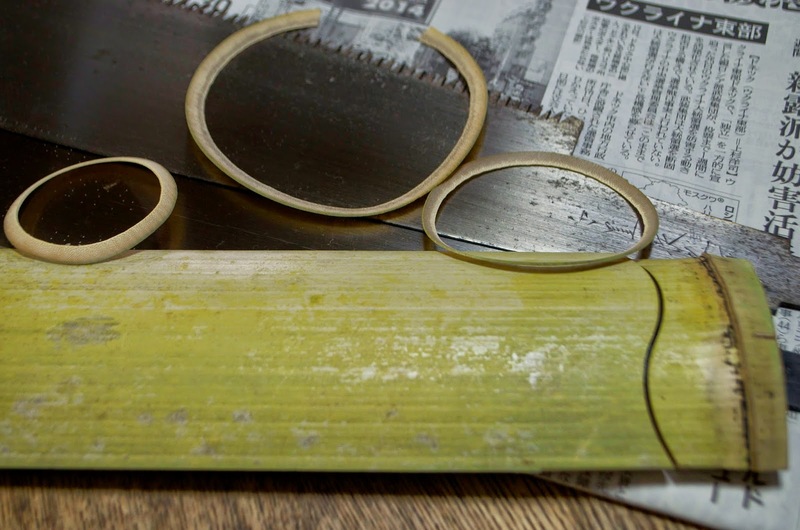 He showed me how he sliced paper thin slices of bamboo, notoriously hard to cut. Note the curved cut in the bamboo. He then showed me these two saws with odd, Western-style handles. 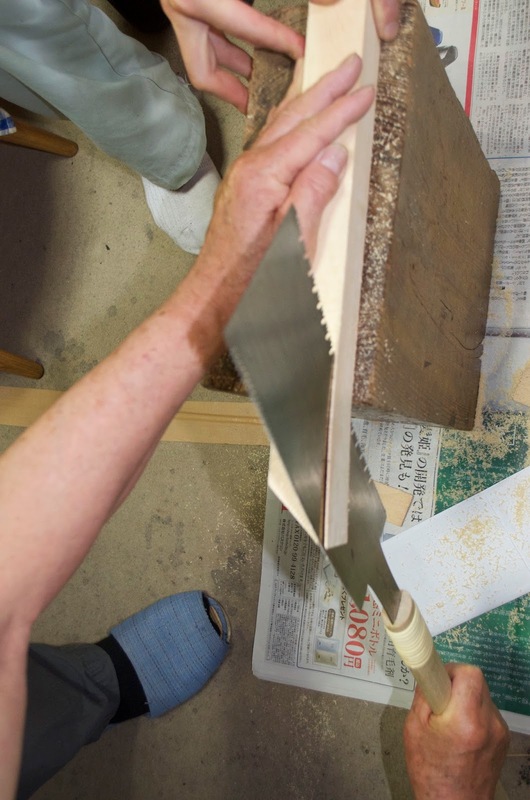 He explained that he had taken two regular ryoba saws, filed the teeth completely off, then re-cut and filed Japanese-style teeth to cut on the push stroke like Western saws. He said he did it just for the heck of it, but consider how much work this required! 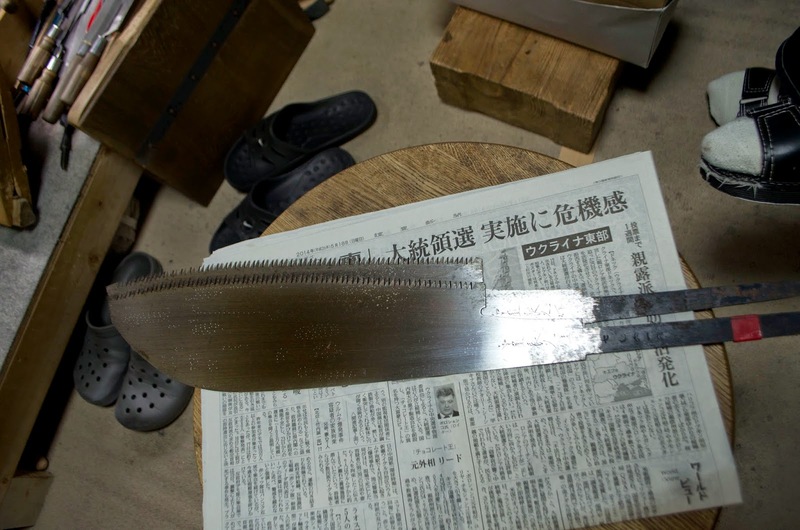 I have never seen this: Western-style gullets cut into a normal Japanese saw. Another innovation of the saw sharpener. He enjoyed showing me how he could make nearly paper thin cuts. We continued to talk about people we knew in common until his wife came in and showed me a photo album of their travels around Japan. I turned the page and there we both were (on the right) with my Tokyo teacher in 2002! We both had a huge laugh realizing we had met over ten years ago. 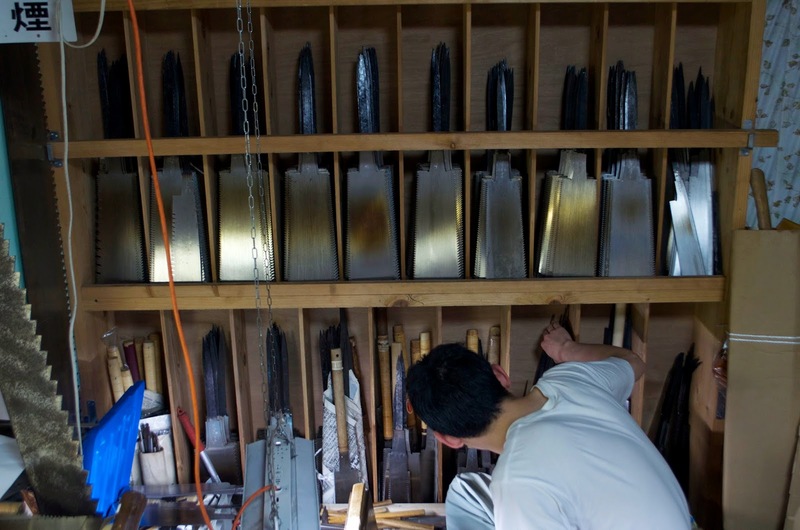 He insisted on sharpening my new saw so I will pick it up in late June when I return to Kameoka for the launching of the ayubune and the opening of the exhibition. Later I will edit this blog posting with some other images of his shop as well as his website address, so visit again. Yes, Nagatsu-san was here in Belgium last summer giving us the scoop. I neglected to get his mailing address to send my saws off to him for maintenance. Would you provide it? Dear E.DB. Thanks for spurring me to update that blog posting and get that address for you. I am home now and still recovering from jet lag and slow to keep my promises. Nagatsu san showed me a Belgian TV show that featured his visit that was excellently done. Give me a day or two and I promise to post that information on my blog. And thanks for reading. Good it handle a small four stroke Honda outboard motor ? 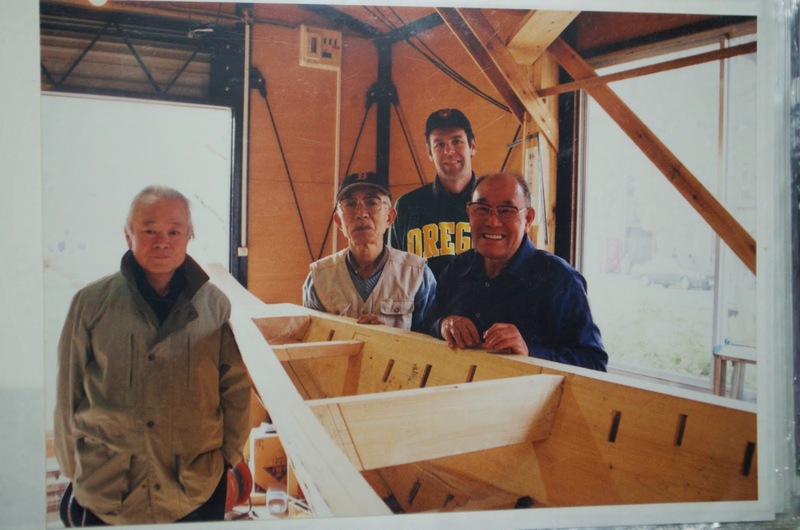 The boat I built in Japan could certainly handle a small outboard. Let me know if I can answer any more questions about the design. 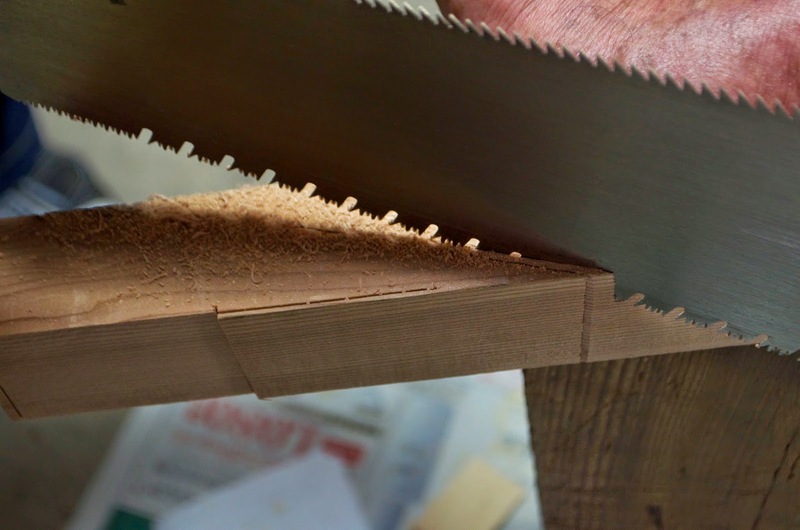 I hope you don't mind, but I used one of your photos in my blog rambling about filing gullets into a saw, inspired by the work of the saw sharpener you wrote about. It's far from his quality, though! I have listed your blog's url as the photo's source, but I can remove the picture from the blog if you wish. As a sidenote, I love reading your blog! I've always loved wooden boats, and really hope to make a canoe one day, might get a chance at college! Just saw your comment and using a photo is fine, as long as you credit me and provide my website or blog address. Thank you for that courtesy. This makes dust gathering hard to control.See here Regardless of this disadvantage, temporary worker saws offer numerous incredible highlights for the middle of the road carpenter.